Victorian Purse project from Victoria Sampler…a bit of a saga! I love making etui sets, and I also love anything designed by Thea Dueck, of Victoria Sampler in Canada. So when I came across this exquisite design for a Victorian Purse etui, I knew I had to have it! I bought the chart pack (it only comes as a chart, not a kit) from Sew and So. I saw it on their website just before Christmas, but didn’t get round to buying it till a few weeks ago. It saves a lot on the shipping for me to buy it from within the UK, than buy it direct from Victoria Sampler, as the shipping would be pretty steep that way. Then I started reseaching for the bits and pieces to make the etui itself. Usually, I have enough stuff in my stash not to have to buy the accessory packs that Victoria Sampler sell separately. I have enough threads to probably open my own shop…..but with this one, it just didn’t work out like that. 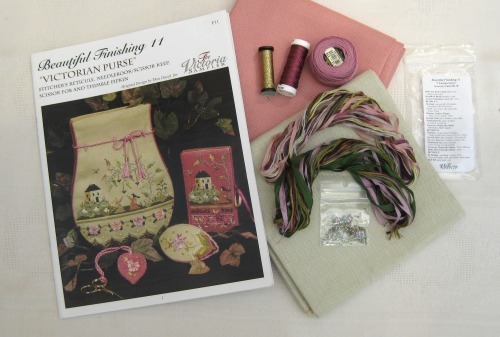 The design calls for Perle 12 thread in a lovely soft pink, and narrow silk ribbon, and tiny frosted pink beads….stuff that I just didn’t have. So, when I started tracking down online stockists for these things, the price started to add up (with shipping on top, from various suppliers). Then, as I was back on the Sew and So site, I happened to see that their stock of the accessory packs were 20% off. No contest, really. The pack has lots of lovely threads and ribbons, in pink, green and cream shades, plus some Kreinik metallic braid, some beads, and some silk twist. The fabric was another matter. I *thought* I had something suitable, in a box in the loft….several sortings-out later, I had to admit that I’d imagined that. So, I ordered some Jobelan 28 count Dark Rose evenweave for the pink fabric. It was half price, as it was the last piece of a discontinued colour. The greeny-beige, though, was even more of a problem, as the fabric recommended in the chart pack has been discontinued by Zweigart already. In the end, I decided to use Zweigart’s Cashel linen, Platinum shade (which you can see in the top picture). It’s got a slightly green tinge to it, so it should work OK with the thread and ribbon shades from the accessory pack. Can’t wait to get started on this! Thea’s designs are always interesting to do – lots of little challenges, such as stitches I’ve not done before, and the projects are really innovative….. 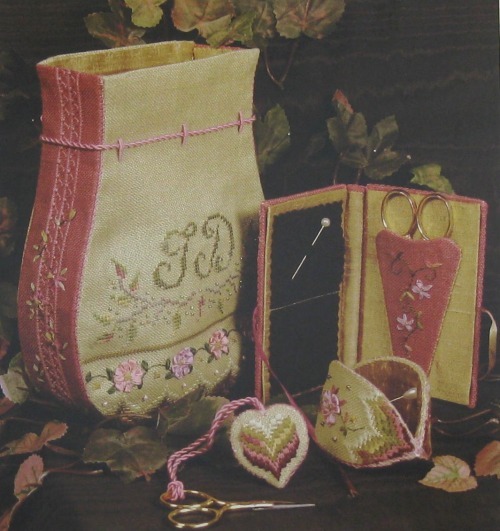 Author Janet GrangerPosted on July 28, 2016 July 27, 2016 Categories Victorian Purse by Thea DueckTags Cross stitch, Embroidery, Etui, Thea Dueck, Victoria sampler, Victorian purse6 Comments on Victorian Purse project from Victoria Sampler…a bit of a saga!